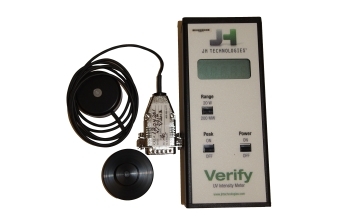 The Verify meter meets all the requirements of IEC, UL, and CSA. The measurement range is from 1.00mw/cm2 to 19.999 W/cm2 (20W/cm2) in two scale positions. The peak switch allows measuring and holding the maximum reading that the probe encounters. Probe wavelengths from 220nm to the visible range are available.